In compliance with Coded Memoranda AA-2015-22 (PDF) and Coded Memorandum AA-2013-03, the Executive Sponsor for California State University, Northridge (CSUN), convenes the ATI Steering Committee at least twice each year. Since that steering committee is comprised of executive administrators, among others, and because there are so many units on the CSUN campus that work on or with accessible technology, it is in CSUN’s best interests to have subcommittees and working groups that report up to the ATI Steering Committee, as outlined below. Where possible, existing CSUN committees have assumed these ATI responsibilities. In addition, other CSUN committees include ATI representatives. Organizational chart for ATI governance, as described below. The ATI Steering Committee extends the Executive Technology Steering Committee (ETSC) and oversees the work of all of the sub-committees. The ATI Services Committee reports up to the ATI Steering Committee, and guides the work of the other sub-committees. The ATI Coordinators are the first point of contact for ATI in their respective areas. They report through the ATI Services Committee. 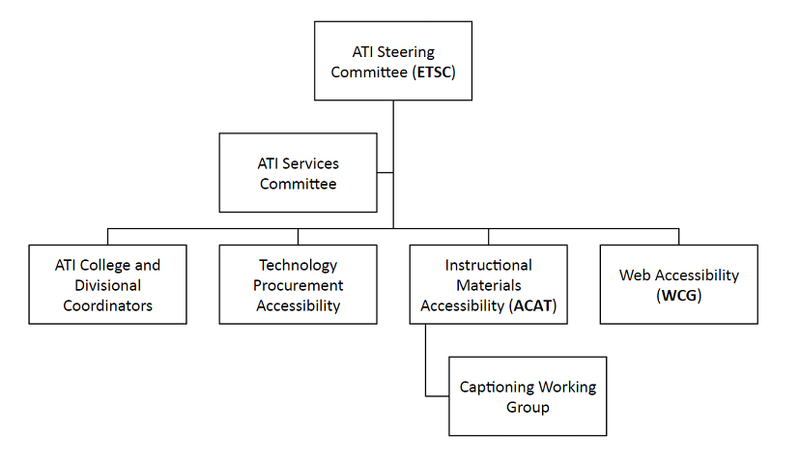 The Web Accessibility Group extends the Web Coordination Group (WCG) and reports through the ATI Services Committee. The Technology Procurement Accessibility Group reports through the ATI Services Committee. The Instructional Materials Accessibility Committee extends the Advisory Committee for Academic Technology (ACAT) and reports through the ATI Services Committee. The Captioning Group reports through the Instructional Materials Accessibility Committee.